Happy Friday! 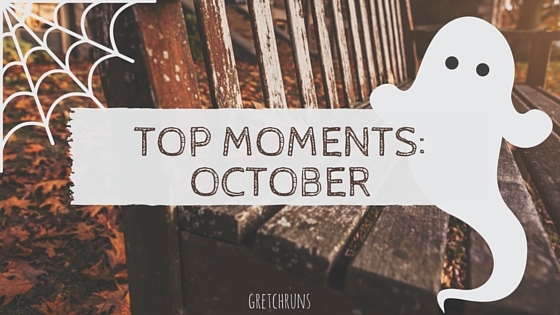 It's the end of October, and what a crazy month it was! This was definitely the busiest month I've had all year, so it completely flew by. Today's post is going to be all over the place and a bit cray (goes along with the "theme of the month", eh?) - I'll be sharing some of my favorite moments of the month, some recent news that caught my eye, fashion favorites, and what I'm listening to. Let's go! A huge highlight of the month was our trip down to Tennessee, and celebrating my future father-in-law's wedding! I enjoyed getting to meet some people on Michele's side of the family, as well as spend time with Dan's family. It was such an amazing weekend and the weather could not have been any better! I had three races this month, and they all ended up being amazing! First up was Run Shadyside 5k, which I ran with Dan. He ended up getting a huge PR in that race which made me so happy! Next was the Towpath Half Marathon, where I finally broke 2 hours. I was thrilled with that race and super proud for getting over that hurdle I've been struggling with for years! Finally, I ran the Pittsburgh 10 Miler and took a few minutes off my time from last year! What a great month! This article made me so, so happy. I used to be a huge Black Friday lover- my mom, sister and I would head out early in the morning after Thanksgiving to get breakfast and find deals at the mall. Even if we didn't end up buying anything we always had a great time! It's been really sad to see how this "holiday" has changed in the past few years- most places staying open on Thanksgiving day and so many injuries and deaths that I have no desire to support it anymore! Seeing a company (especially one based in Pittsburgh) do their part to stop this makes me really happy and want to support them when they are open. Hopefully other companies will follow suit! Have you heard that Gilmore Girls is returning for a "final season"? There are going to be four 90-minute episodes, with each set in a different season. One of my favorite parts of the show was seeing the changing seasons: Lorelei dragging Luke outside to see the first snow flakes of the season, pumpkins and hay decorating Stars Hollow for fall...it makes me so happy! I'm sad to hear that Melissa McCarthy won't be returning, and of course the show won't be the same without Edward Herrmann. I'm still excited, and hope for a Rory/Jess reunion! I love these wedge booties! I wanted to show what they look like on the side, hence the awkward pose! This is one of my favorite sweaters- it has faux leather details on the shoulders and is the perfect length! This skirt is so comfortable and cute, but it wrinkles horribly! Alexa and Mark danced to this song on Dancing With the Stars this week, and I immediately downloaded it. I love any song with Spanish-style guitar, and this one is so interesting! It has a slightly spooky sound to it-perfect for the Halloween episode! Everyone went crazy for this song as soon as it was released (hello...100 million views in less than a week!? ), and I'm joining in the crazy! Adele has such a unique, haunting, beautiful voice that's so full of emotion. She's basically the female equivilent of Sam Smith! Could you imagine if they did a song together!? I love Ariana Grande's voice, and this is a really fun song. I love how it sounds so playful and light hearted..until you listen to the lyrics. Viktor is one of my favorite competitors on the Voice right now, and I thought his Knockout round song was amazing! Alicia Keys is one of my favorite singers and songwriters, and I've always loved this song. I couldn't believe that Adam didn't pick him, but wasn't entirely shocked since he was paired with the incredible Jordan. Thank goodness Gwen stole him! How did I never know that Demi Lovato did a song with Missy and Timbaland?! I mean, does it get any better than those three? This song is so fun and I'm in love! What's your opinion on Black Friday? Was there one month that was crazier than usual for you? I stay as far away from shopping as humanly possible on Black Friday. That's a time for me to relax and eat leftovers! :) Good for REI. What a great month for you! I agree! Leftovers are the best part of Thanksgiving food right? Same here! I would always go in the morning with my mom and sister and it was a great tradition. We went to Penney's especially for the Mickey Mouse snow globes. My family would bring us all the ads to Thanksgiving dinner and tell us what sales were the best. Now it's just not fun at all and dangerous! SO excited for Gilmore Girls, and I love hearing everyone's predictions! I'm personally pulling for Jess as well! yeah i am not a fan of black friday either. i am more of an online girl. at home, we do a big shopping thing the day after christmas, boxing day (or the day after boxing day, depends on when it falls during the week) but if they ever decided to open on christmas, i wouldn't be down for it. anyway, i think if companies ask people if they want to work, different story. especially if they pay more and people decide to do it (i worked at target in HR a couple of years ago over the holidays and several people did not want to be at home for the holidays so were begging for those shifts) but forcing people to work on a holiday is not cool. I love REI's opt out! Just when I thought I couldn't love that company more.. Those outfits are so spot on! The fall is my favorite season for fashion. I hope you have a great Halloween weekend! I agree with you! Now I want to start patronizing them more. Great business model! Hope you have a great weekend as well!! I've never been interested in Black Friday, and companies hype it up to the extreme. That's why people are acting the way they are. Offer the deals online and spare me the drama, please. I put up Christmas decorations that day and watch movies. I might workout depending on how I feel. Most of the deals aren't even that great! I read a study that the typical sale isn't even more than any other holiday. Why the hype then? Your black friday sounds perfect! I need to fly you out here to take me clothes shopping. I need help, and I loooove your style. I'm downloading all of those songs today! And Gilmore Girls is my absolute favourite show in the whole entire world. I'm so excited about this! I would seriously love that!! That would be a fun, fun weekend. Set it up!! I love this post! It makes me so happy, because this month has been so crazy for me, and I needed the catch up. You definitely had a fantastic running October, loved that you got out of the city, YES to REI. I've become less and less of a shopper over time as well, unless we are talking groceries :D Now THAT would be my Black Friday! You know what I am excited about? The remix of Hello. Don't you know it will be great! I love REI! They're a local Seattle company and the flagship store here is one of my favorite places. Just when I thought I couldn't love them more, they close for Black Friday! It looks like you had a great month - congrats on all those PRs! Hope you have a great weekend! There's another flagship in Pittsburgh that I love! Now I want to shop there more and support their great morals. Goood for them :) Thank you Laura! I've never been a fan of Black Friday. Honestly, I don't really like shopping! I know, I know. I hope I can do most of my holiday shopping online. Hello, Amazon Prime. You had 3 great races and an awesome month! That's a great pic of you two in TN. I think it's great that some big stores are saying no to Black Friday. I think it's really sad that Kohls and so many others are open on Thanksgiving for a start to shopping. Give people one day to spend with their family at least. It's horrible!! I stop supporting stores like that around the holidays..it's just horrible and sending the wrong message. I am beyond excited for gilmore girls... I was so excited to hear about this. Any idea when this is finally happening!? what an awesome month!! seriously! and it flew by so dang fast, too. congrats on your runs for the month! It went by SO quickly! Thanks for the support Elle! Congrats on your running PRs! That's really exciting. You were quite busy with races this last month! Keep it up!